Recent years have witnessed a flurry of archaeological activity in India, Pakistan and other parts of South Asia, producing an enormous wealth of data and consequently making most of the general books on South Asian archaeology out of date. This encouraged the authors to attempt a balanced and holistic synthesis of the new evidences and research material. 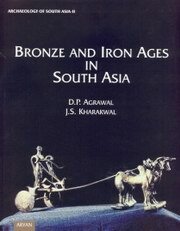 To do justice to the vast data, the project (Archaeology of South Asia) was planned in two volumes. The story of humans from the beginning of the Stone Age to the advent of agriculture and animal husbandry was covered in South Asian Prehistory published in 2002. The present volume, Bronze and Iron Ages in South Asia, second in the series, incorporates the latest results of research on Indus valley civilization and other cultures of bronze and Iron Ages. The book attempts to give an interdisciplinary survey of Indian archaeology giving due emphasis to technology and environmental changes. The Indus civilization, which required a much fuller treatment, has been studied in great detail as also most of the Chalcolithic and Copper Hoard cultures. The Iron Age cultures and some of its outstanding issues such as the origin of iron technology, making of wootz steel and the way iron contributed to the socio-economic processes associated with the second urbanization have also been dealt with in detail. This work also shows that a close interaction existed between the Ganga Valley and the Central Himalayas since the Bronze Age. The concluding chapter summarizes the evidences and points towards the lacunae to be filled and the new directions of research. The book clearly delineates the difference between the characters of the first Bronze Age urbanization of the Indus Valley and the second Iron Age urbanization of the Ganga Valley. It brings out a multidisciplinary synthesis of archaeological, linguistic and paleo-climatic data. Profusely illustrated with maps, line drawings and plates, the book will interest the general reader and will be immensely helpful for the students and scholars of South Asian archaeology in particular. Environmental changes and civilizational processes. Decline and legacy: Late Harappan. Iron and other metal tools.